I was recently loaned the video titled Between the Folds, A PBS Independent Lens movie. I fell in love…again. When I was a child I had several origami books (which I wish I could find!) and spent hours folding and folding and trying to figure out the diagrams for creating all kinds of animals, boxes, people, etc. I have continued to enjoy origami as an adult, buying a book here and there to share with my kids. Currently in my art classes at school, I’m teaching tesselations. 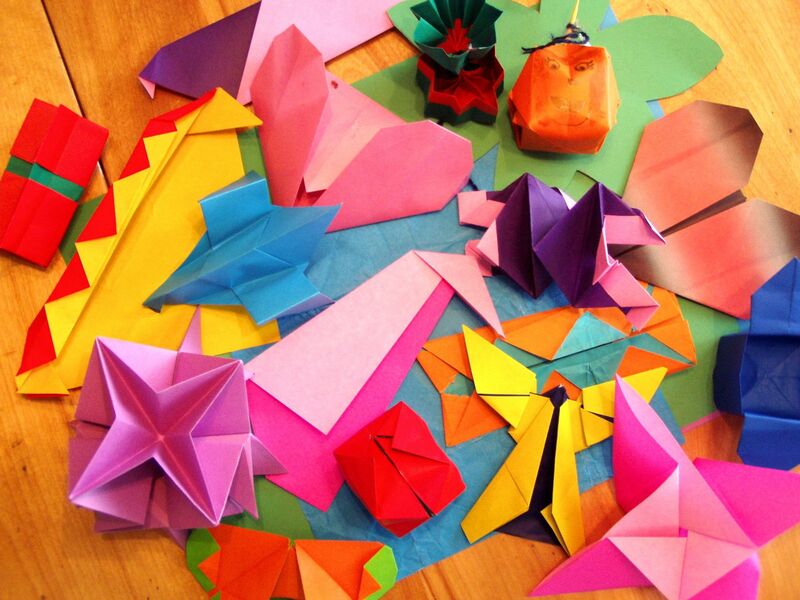 To my delight, I discovered in this film that Origami is a kind of 3-Dimensional tesselation! How cool is that! I was enrapt from the beginning of this video to the end as it expounded all the heights to which origami is currently taken. An exquisite art form, a way to teach geometry and other mathematical subjects, a practical problem-solver for industry, as well as huge scientific strides being made through Origami. If you can get your hands on the full, hour long video, PLEASE DO SO! It is hugely inspiring!!!! An amazing origami artist who makes his own paper prior to folding it. My favorite origami artist in the video whose work is breathtaking and whose personality is equally delightful! I’m sad to see he is deceased…what a wonderful artist! The above photo is of all our creations this past weekend. Maddie, Catherine, and myself made lots of cool things from butterflies to swans to boxes, to a person and on and on. This is too much fun! You should go pick up an Origami book and some square papers (I’ve often seen very inexpensive books with papers in the Bargain section of Barnes n Nobles) and you will have so much fun!! **To be noted: the first three letters of Eric Joisel’s last name, are the French word for Joy. He indeed brought a lot of joy into the world through his art!